On Saturday, June 6th, Belmont Park will once again take center stage to host the final test in horse racing’s famed Triple Crown—the 147th running of the Belmont Stakes. Belmont is the consummate Triple Crown closer, as the race has long since been regarded as the test of a true champion. Many horses have won the first two legs of the Triple Crown—The Preakness and The Kentucky Derby—but only 11 have gone the distance in all three. Attending the Belmont Stakes is a unique and rousing experience; everything from the history and lore of the track itself to its facilities and the energetic atmosphere it exudes add to the allure of the legendary race. Belmont Park had its first race back in 1905 and has been the final leg of the Triple Crown since 1931. Since the first hoof hit the dirt at Belmont, the park has cultivated a reputation as one of the most respected racetracks on the planet. Known for it’s difficulty, at 1.5 miles in length, the Belmont Stakes is the longest of the three Triple Crown races by a solid margin, and its distance makes the race an extremely tactical one. 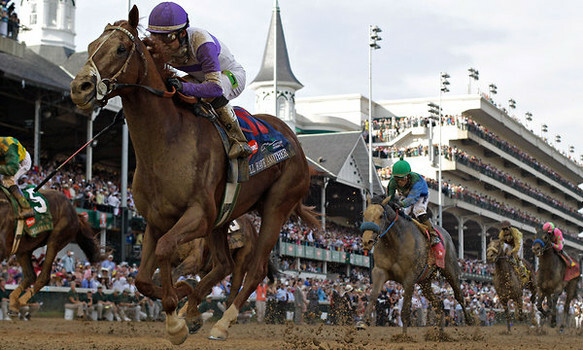 Many horses tend to burn out in the last quarter mile or so making the final length of the race one of the most exhilarating moments in sports. A visit to Belmont Park on any regular day can be an exciting experience, but to go on the day of the Belmont Stakes is entirely different—its akin to the disparity between attending a regular season Yankee game vs. game 7 of The World Series. The Belmont Stakes is a decidedly singular event—there’s really nothing else like it—and it should be treated as such. So make a day of it. Have one of our cars pick you up and whisk you off to the park so you can unwind during the trip out, and enjoy this one-of-a-kind event without worrying about driving home or beating the traffic. Parking on the day of the Belmont Stakes can be a bit of a hassle to say the least, and simply navigating the areas surrounding the park can be quite a chore as well. Set your mind at ease so you can concentrate on the races and all that surrounds them. Our Chauffeurs are detail-oriented experts that will ensure your ride to and from the park is comfortable and stress-free. And our fleet is wide-ranging, luxurious and state-of-the-art, with every vehicle being WiFi equipped. let us at Bermuda take care of the “to” and “from” so you can have the most memorable, worry-free Belmont Stakes experience attainable.